THe route continues about 100 miles as NC 32 to US 17 Business, Washington, NC. Creation: Appeared in Oct 1940 as a renumbering of part of VA 10 running from US 58-460/VA 10 (now VA 337) Suffolk south to the North Carolina line. This is the 3rd VA 32. Adjustments: In Jan 1941 (CTB), VA 32 was extended north along VA 10 to end at Benns Church. In Sept 1943 (CTB), the Jan 1941 action to extend VA 32 to Benns Church was rescinded. In Feb 1951 (CTB), VA 32 was re-extended along VA 10 to Benns Church, then along US 258 north and then US 17 north to end at VA 168 (now VA 143) Newport News. 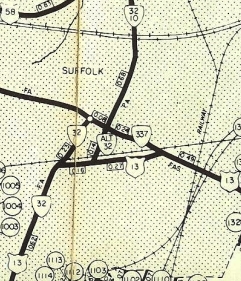 The first official map to explicitly show VA 32 north of Benns Church into Newport News was the 1961 issue. In April 1979 (CTB), VA 32 was rerouted in Suffolk from Saratoga St and Washington St (see scan in VA 32 ALT entry) to its current Caroline Ave routing through downtown. North of Hall St this was a replacement for VA 32 ALT. On March 19, 2003, the Southwest Suffolk Bypass opened. As there are a couple VA 32 Bus postings, VA 32 may have been added to this, although traffic logs continue to show VA 32 through Downtown Suffolk. In 1976, VA 32 was multilaned from Suffolk south to the US 13 split. In 1980, VA 32 was multilaned from Newport News across the James River, over to Benns Church, then south to the Suffolk line. In 2003, VA 32 was placed on freeway when it was (maybe) added to the Suffolk Bypass. In 2016, VA 32 was placed on newly constructed Benns Grant Blvd to cut between VA 10 and US 258 in the Benns Church area. Posted: Fully posted except not on its US 17 duplex anywhere back to at least 1991. There is a posting on 32 NB at US 17 indicating VA 32 north does continue with US 17-258; The last known cutout was in central Suffolk which was still there in 1993 but long gone now; In 1991-93 there was an erroneous US 32 shield on US 17 NB at the US 258-VA 32 jct. Old Truck Route: A TRUCK VA 32 used to be posted at US 13/58/460 BUSINESS at Wilroy Rd in Suffolk, though this posting was gone by July 2005. Comment: The VA 32 extension to Newport News is sorta pointless if it is not posted all the way there. I'm guessing it is faster to use US 58 and I-664 to go from Suffolk to Newport News at this point, so truncating VA 32 to downtown Suffolk makes some sense. Or if US 460 is built on new alignment from Suffolk to nearly Petersburg VA 32 could be routed along present US 460. South of Suffolk VA 32 runs near the west edge of Dismal Swamp. VA 32 initially began where today's SR 822 enters Virginia from North Carolina near Soudan. SR 822 ends at Buggs Island Lake and VA 32 would've continued north. Driveable road picks up again with SR 821 Old National Hwy at the Merifield Wildlife Management Area. Alas, SR 821 ends at another arm of the lake. VA 32 picked up SR 1102 5th St on the other side into Clarksville. As far as I can tell, VA 32 headed east on today's US 58 Business and crossed the Roanoke River in about the location of today's lake crossing. VA 32 then picked up US 15 to following US 15 to Bluestone Creek, then used these loops along US 15 to the Charlotte County line: SR 857 Mooresville Rd; SR 858 Oak Hill Dr; SR 859 Whitetail Rd; SR 700 Turkey Rd. In Charlotte County, VA 32 used US 15 north to past Redoak to SR 631 north to Jones Store and SR 624 east back to US 15. VA 32 followed US 15 through Wyliesburg, then US 15-360 northeast. A little past SR 628, VA 32 veered more northerly on abandoned routing, then picked up SR 713 Deuprees School Rd to VA 47, then Woodland Ln and Ferraro Ln northeast back to 15-360. After Walkers Store, VA 32 used SR 622 Old Kings Rd, then US 15-360 Business through Ontario. VA 32 used 15-360 Business through Keysville except I believe it used SR 629 Southern Dr south of VA 40. VA 32 picked up mainline US 15 north of town into Prince Edward County. VA 32 more or less followed US 15 to Farmville except for a couple abandoned loops and SR 630/677 loop through Redd Shop. VA 32 exited Farmville west along High St/Buffalo St over to US 15 Business. VA 32 used the length SR 695 over to Dowdy's Corner before heading north on US 15 to Buckingham County. VA 32 followed US 15 north except used SR 689 loop near Sheppards; abandoned loop south of Curdsville; SR 600 loop; abandoned loops at Willis Mtn and north of SR 686; SR 750 Mingo Ln north of Sprouses Corner. In Dilwyn, VA 32 followed US 15 except SR 1010 Gold Mine St. VA 32 followed US 15 to the James River except it used SR 715 Circle Drive Rd and SR 796 Old 15 Rd. At New Canton, VA 32 used Sr 670 Banks Family Rd, then SR 687 Boat Landing Ln to the James River. VA 32 crossed the James and continued north on SR 657 Bremo Bluff Rd. It is possible VA 32 used SR 666 and somehow connected back to US 15 further north but I cannot prove it. Otherwise, VA 32 used US 15 to Fork Union and Dixie. North of VA 6, VA 32 folled 15 except abandoned old SR 691 loop; abandoned loop at Carys Creek; SR 673/649 loop at Fluvanna County High School; abandoned loops on both sides of 15 north of SR 649; VA 32 used 15 to near VA 53 but then ran on an alignment a little further west to cross the Rivanna River directly to SR 1001 Main St through Palmyra. North of Palmyra, VA 32 used US 15 except: SR 632/661 loop; SR 644 Friendship Rd; abandoned old SR 644 loop just south of SR 613; SR 644 Salem Church Rd/Poorhouse Ln (no longer connects back to US 15). VA 32 then veered northwest on SR 631 Troy Rd which used to connect directly to SR 689 Edgecombe Rd. VA 32 used SR 689 to SR 615. VA 32 followed SR 615 west, then north on Columbia Rd to VA 22. VA 32 headed east on VA 22 to Waldrop, then used SR 672 which used to connect to SR 603 back to US 15. Approaching Gordonsville, VA 32 veered across the railroad (closed now) to use SR 729 S. Main St back to US 15-33 through town. VA 32 then headed north on US 15 except it used the SR 686 Thoroughbred Rd now-only-half-a-loop. Near Madison Run, VA 32 veered northeast through the Orange Livestock Market to connect directly to SR 647 Old Gordonsville Rd which VA 32 followed to Orange. VA 32 used US 15, then VA 20 south, then VA 20 Business north back to US 15 to negotiate through Orange. North of town, VA 32 used 15 except SR 721 Bennetts Ford Rd; SR 723 Petersburg Rd; abandoned loop over Rapidan River using a bit of SR 659. In Madison County, VA 32 followed 15 except at Locust Dale it used SR 634 northwest, then abandoned road back east to 15 and Culpeper County. VA 32 ran west of US 15 on what is now abandoned road from the Robinson River to SR 721, then used SR 721 White Oak Rd, SR 648 Cedar Ridge Rd; lenghty abandoned alignment along the tree line west of US 15; a section of SR 657 General Winder Rd; abandoned routing across US 15 to connect with SR 692 (at SR 649 jct) Old Orange Rd. VA 32 followed SR 692 for quite a distance before connecting back up with US 15 in the VA 299 area. VA 32 followed US 15 Business into Culpeper but continued past VA 3 on Orange Rd directly to Main St. VA 32 used Main into central Culpeper, then used Piedmont St east to Clay St which turns into Old Brandy Rd. VA 32 followed this out to US 15-29 Bus, then at the current Bypass veered over to SR 684 Bel Pre Rd, then SR 663 Stevensburg Rd, then SR 700 and SR 669 Carrico Mills Rd into Brandy Station. At SR 762, VA 32 headed northeast to connect to SR 685 Fleetwood Heights Rd over to Elkwood, connecting directly to SR 755 Elkwood Rd (no road does this anymore) back over to US 15-29. VA 32 then veered over with US 15-29 Business and just after SR 673 veered onto abandoned alignment to cross the Rappahannock River directly to SR 1202 Willis Ave/River Rd back over to US 15-29 Business in Remington. VA 32 followed 15-29 Bus to US 15-29, then used VA 28 northeast to US 17 near Bealeton. VA 32 then used both SR 837 loops along 17 north, then abandoned routing to about 500 ft short of SR 844. VA 32 then used US 17 to Opal, then US 15-17-29 north (possible it went 0.4 miles down SR 687 then northeast on abandoned road back to 15-17-29) to SR 800 Old Culpeper Rd which used to connect back to 15-17-29 just south of SR 616 Beach Rd. Approaching Warrenton, VA 32 used US 15 Business to the courthouse, then Winchester St north to US 17 Business north out of town. VA 32 followed US 17 except it used abandoned routing to the east at SR 628, then SR 860 at Cedar Run. VA 32 used the SR 777 loop but it is unclear if it ever used SR 699 Merry Oaks Rd. VA 32 picked up VA 245 through Old Tavern over to The Plains, then after a brief jaunt on VA 55, used SR 626 north to US 50 Middleburg. VA 32 followed US 50 east through Aldie, then north on US 15. VA 32 followed 15 except for several visible abandoned alignments plus SR 899. 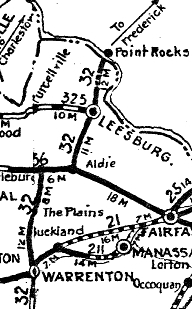 VA 32 used US 15 Business through Leesburg, then US 15 north through Lucketts. About 1/2 mile short of the Potomac River, VA 32 used a visible old alignment to the east that crossed 15 onto SR 672, then northeast to where it crossed the Potomac River into Maryland. About 1926, VA 32 was removed from today's VA 28, US 17, SR 687 routing from Remington-Bealeton-Opal and placed on today's US 15-29. Based on paving VA 32 was also removed the SR 800 Old Culpeper Rd loop. 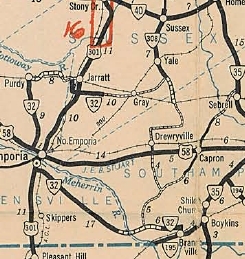 Also in late 1926, US 501 was added to VA 32 from Wyliesburg to Keysville. Around late 1927, US 15 was added to the entirety of VA 32. Also, VA 32 was placed on current US 15 from Red Oak to Wyliesburg. In 1931, VA 32 was placed on modern US 15 from Madison Run to Gordonsville and also removed from Main St in Palmyra. In July 1933, VA 32 was dropped from US 15. 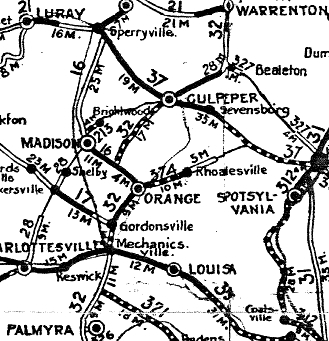 In one place on the 1926 Official, VA 32 is misidentified as VA 82. VA 32 #2: Appeared in July 1933 as a renumbering of VA 509 from VA 35 Boykins through Emporia towards Purdy. A second piece of VA 32 ran from the Greensville-Sussex Line at Jarratt east 4 miles to just short of Henry. A third piece ran from VA 48 (now VA 40) above Sussex C.H. south to about Yale. Pieces 2 and 3 were a renumbering of VA 538. VA 32 was shaped like an upside down question mark. In Aug 1936 (CTB), the main piece of VA 32 was extended north to Purdy, then east towards Jarratt, leaving a gap of about 3.5 miles to Jarratt. Also, the Sussec C.H. piece was extended south to the Southampton County Line. In 1937, the Sussex C.H. piece was renumbered as VA 308 (now SR 735). 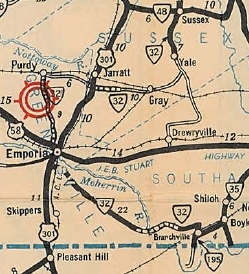 In Oct 1940 (CTB), VA 32 in Jarratt was extended 0.7 miles west into Greensville County towards Purdy ending at SR 639. Then two paragraphs later in the Oct 1940 (CTB), VA 32 was renumbered as VA 195 (now VA 186) from Boykins to Branchville; VA 88 (now SR 730, US 301, US 58 Bus, SR 686 West End Dr, SR 619) from Branchville to Purdy; VA 137 from Purdy eastward and the separate Jarratt to Henry piece (now SR 608, SR 610, VA 139, SR 631). VA 32 ALT: Appeared sometime before 1946. VA 32 ALT used Hall St from Saratoga eastward, then north on Main St to end at Washington St. In April 1979 (CTB), VA 32 ALT was decommissioned. 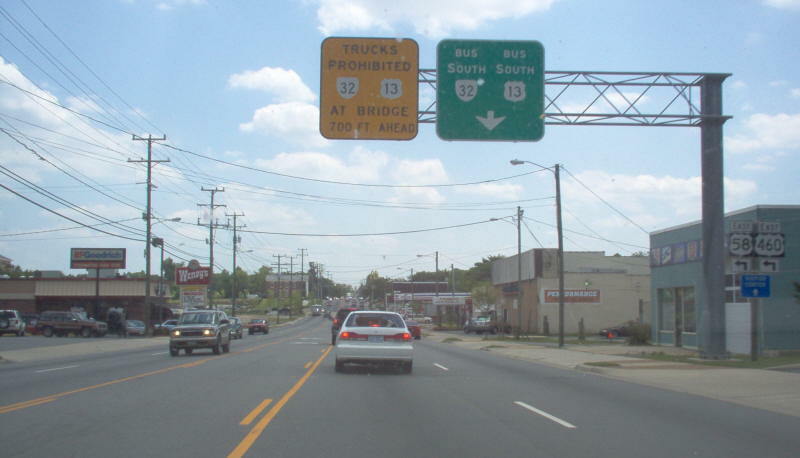 Hall Ave became unnumbered while Main St became US 13 and VA 32. Creation: If this exists, it was created in March 2003 when the Southwest Suffolk Bypass was opened. Posted: Some 32 Bus postings exist.